I used China Glaze High Maintenance as a base, with American Apparel Hunter for the stripes. Tell 'em Freddy sent ya! also,i just saw robbin-hood and it was pretty great! The Nightmare On Elm Street movies are righteous. Really scary, and pretty inventive. I love stuff where the imagination comes into play. Speaking of which, I just watched "My Neighbor Totoro," an animated movie by Hayao Miyasaki- it was wonderful. Can't recommend it enough. But I love all of his stuff. Just fantastic. His "Spirited Away" is one of my favorite movies, ever. Even Freddy Krueger isn't as creepy as IMBEDDED SPAM!!! LOL i agree with rita. WTF!? Ms. Daily Nail! You don't have to apologize...it's the damn spammers (dammers? ;-D) who should apologize- to you, in a big way!!! You are fabulous, they are not. So sorry that they clog up your site. 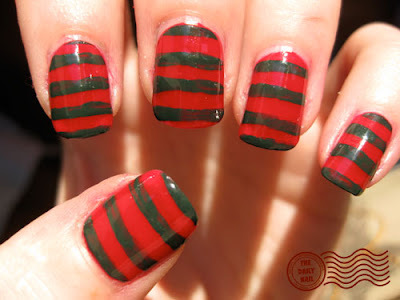 Freddy Krueger should get them in their spam-soaked (eewwwww!) dreams. What a beautiful nightmare - I love those!